New Delhi, India’s capital is a city with a historic past as it was a stronghold of Mughals and Sultans rule. British colonialists also made it their capital in 1911. As a result it has an enviable mixture of traditional, western and modern architecture, spread out through the vast city. Travel to Delhi offers attractions like heritage monuments, museums, amusement parks, religious centers, shopping malls, restaurants and nights clubs. New Delhi International Airport is also known as Indira Gandhi International Airport. People who come to India from abroad to visit Leh-Ladakh have to switch their flight from this airport. Even for domestic tourists going to Leh via flight have to switch / start their flight from New Delhi Airport. It’s a huge fort which stands out among all forts in India due to its magnificent size and the lofty towers that stands on all of its sides. The fort was built Shahjahan, a Mughal Emporo in the 17th century on the Yamuna river bank. Its main construction material was sandstone, the best building stones at that time. Visitor to the Red Fort will enjoy viewing historic monuments such as Hamams, Rang Mahal and the Diwan-e-Am as well as light and sound show in the fort gardens that recreates the fort’s glorious past. It’s a famous War Memorial built in the 1920s to honor Indian soldiers who died fighting in World War I. Inscribed on its walls are the names of the gallant soldiers who were consumed by the war. Indian Gate is a must see for every visitor especially its prominent scenery, Flame; a rifle with its muzzle facing upward and a helmet perched on its top. Indian gate is surrounded by lush-green gardens, water fountains, water ponds for boat rides and a view point for the Presidential Palace, Raisina Hill. Commonly called the “Old Fort”, this massive fort is situated south-east of India Gate. It was constructed by the Mughal Emperor Humayun as his seat of power. Tourist can enjoy viewing the elegant Purana Qila as they take a boat ride. While inside the fort they can view the lovely Sher Mandal and Qila-i-Kunha Masjid. 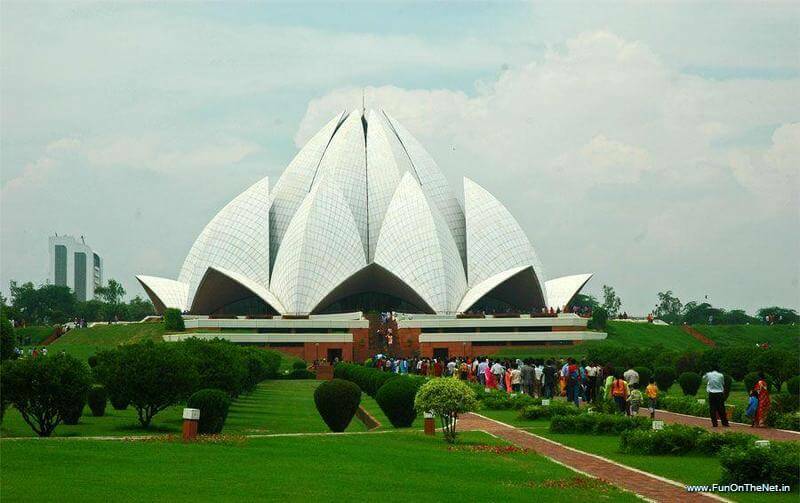 The Lotus Temple, also known as the Bahai House of Worship is among the most recognizable landmarks in Delhi. The building is designed with the shape of the lotus flower featuring twenty-seven flower petals all which are constructed with marbles. This religious structure is filled with well-manicured gardens that are cool and refreshing to the visitors. There is also a quiet sanctuary where you can sit and meditate for as long as you wish. Lodi Gardens is one of the most popular destinations in Delhi thanks to the scattering combination of the old Mughal Tombs and Ancient Structures. This public park is similar to the Hauz-Khas Complex although it is much grander and more impressive. You can enjoy picnics here, relax or walk around the gardens while enjoying the cool fresh air as you explore tombs that are as old as 500 years. Mahatma Gandhi is among the world’s most renowned Leaders. His image is used in Rupee notes and he is recognized as the founding father of the current modern and independent India. The Raj Ghat is a memorial that is dedicated to Gandhi. It is located in Delhi, where he was cremated. Situated on the banks of the Yamuna River, this memorial is an extremely cool and quiet place that offers visitors a relaxing ambiance in the busy and crowded Delhi City. Qutab Minar is the tallest minaret worldwide that is made of bricks. Its design mimics the ancient architecture of the Indo-Islamic. Although its construction was completed around 1206, the main reason behind it still remains a mystery. There are speculations that it was built to signify the beginning of the Muslim Rule while some people say that it was used as a call center for prayers. Qutab Minar has five stories which are distinctively designed with intricate carvings and Quran verses. Visitors can also find other historic monuments here. This tomb was the last refuge for Humayun, a Mughal Emperor. It is located on the eastern side of Delhi and its one of the mausoleums that highlight the Mughal Architecture. Humayun’s design is the inspiration behind Taj Mahal’s architecture. The tomb which was built in 1570 contains the body of Humayun, other Mughal Emperors and members of their clan. It is the first tomb-garden in the Indian sub-continent. The spell-binding structure stands on a platform that is seven meters high and it was constructed using red sandstone. Humayun’s tomb is a two-storied building that’s crowned at the top with beautiful Persian marbles, which makes it attractive to visitors. Delhi is a city that is throbbing with life hence there are limitless activities to engage in which suit every taste and interests. Wide range of cultural events, especially in an open-air setting. There are a lot of traditional music dances and festivals throughout the year which you can participate in. shopping is a must do activity when you travel to Delhi. There dozens of bazaars and shopping malls bustling in the city. Make sure you buy some Kashmir carpets, Indian garments, handicrafts and Buddhist antiques as souvenirs. Biryani was the favorite food for the Mughal Emperors and since then it has become one of the most loved foods in Delhi. The meat or poultry-based dish is usually prepared in earthen-pots and soaked with different spices. Delhi serves the best Mughlai Biryani with a specialty that is consistent and authentic in taste. Parantha is among the must-taste foods when you visit Delhi. The Indian Flatbread can be served as plain or in a variety of stuffing such as eggs, cauliflower, potatoes, bananas, radish or dal. As you walk through the lanes of Old Delhi, you can’t help but get drawn in the sweet aroma of one of Delhi’s signature delicacies, Nihari. It is a spicy rich and slow-cooked meat that is normally served along khameeri rotis or tandoori rotis. Nihari was the favorite food of the ancient Indian Royal Family. Chole Bhature is best eaten on an empty stomach. Given its popularity, the spicy rich and heavy Punjabi dish is a common breakfast meal that is served in nearly all restaurants in Delhi. Momos are tasty dumplings which are available in two options; vegetarian and non-vegetarian. It’s common with street vendors in almost every corner of the city and it’s more enjoyable when it’s accompanied by the fiery-red sauce. Summer meals in Delhi aren’t complete without the Kulfi- a creamier and denser version of ice cream. Chaat is India’s savory snack that is served from food carts, stalls, and side tracks. The sweet, spicy, tangy and crunchy snack can be eaten at any time. Delhi restaurants serve both exotic cuisines and provincial dishes. Chinese, continental, Italian and Moroccan delicacies are served in Delhi’s finest restaurants. The traditional kebabs and samosas are a must serve in restaurants, food plazas or by vendors in the streets. When night falls you can visit popular bars like Maurya Sheraton, Golden Dragon, Civil Lines and Rick’s for live performances by Indian musicians. If there is something that keeps the Delhi’s culinary scene alive, it is the constant availability of different foods and drinks in the streets stalls, local and international restaurants. The variety found here is unmatched. Lodhi Hotel is a luxury eating joint that serves traditional cuisines and the chefs found here are also willing to experiment with different culinary delights. The curried pork tacos, lentil dhal and tandoori prawns served here are unforgettable. Lakhori is loved by locals and guests alike. Its Palak Patta-Chaat which is topped with tasty green chutney is astonishingly tasty. Haus Khas is a trendy center that buzzes with music avenues, hip bars, and cafes which serve drinks such as coffee, tea, cocktails, wines etc. Public transport offers the easiest and convenient means of transport in Delhi. You can flag down a taxi, use a tuk-tuk (an auto rickshaw) or use the new metro which offers more comfort. If you are a lady and you are traveling alone, the metro has a ladies-car at the end of each train. It’s the main bazaar area that is perfect for budget-conscious visitors. It has many guest houses which are affordable and its less than 10 minutes away from the railway station. Paharganj and Chandni Chowk are filled with affordable guest houses but they are also crowded with people. The Connaught Place is filled with spacious streets and lined with trees hence it offers a breathing room which guests need the most. The area is connected with numerous taxis, auto rickshaws, and metro station. Hotels found here are the upscale types e.g. the Leela Palace and Oberoi New-Delhi. It forms one of the biggest parts of Delhi and it’s filled with green trees and huge spacious streets. This Delhi neighborhood has mid-range and luxury hotels that are safe, quiet and comfortable. It’s well connected with the metro services hence you can conveniently get around the city. Saket Bed and Breakfast, Sheraton New Delhi and Hilton Garden Inn are some of the hotels that you can find here. A popular and lively market that has something for everybody. It’s opened daily and you’ll find things such as hippy clothing, Indian artifacts, jewelry, paintings, leather work etc. It’s famous for its cost-friendly designer clothes. The shops and retail outlets found here sell all types of fashion accessories and clothes from reputable brands. Matka is where you’ll find pottery and festival decorations from all over India. Some of the handmade crafts you will find here include plant vases, garden ports, wind-chimes, lanterns, clay figures of Hindu gods/goddesses among others. This is the main Street in the Old Delhi and it features markets that are full of beautiful saris, silver jewelry, dried fruits, spices, electronics etc. Chandni Chowk is an adventurous and busy shopping area that is synonymous with the pop culture in Bollywood movies and songs. Its charm is unmatched and if you love accessories, this is where you will find anklets, earrings, nose-pins, and neckpieces. If you are planning to go to Delhi, the best time to visit is between October and March. During this period the weather is pleasant and flowers are blooming. Avoid going to Delhi between May and July as this is the monsoon season and the city will be experiencing frequent rainstorms and high humidity.